The polarising American President, Donald Trump, has met with 18 of the world's technology leaders to ask for their assistance in modernising US Government computer systems. The White House wants to update government I.T. systems, cut costs, eliminate waste and improve service. US President, Donald Trump cited estimates that the government could save up to US$1 trillion (A$1.3 trillion) over 10 years through such measures. "Our goal is to lead a sweeping transformation of the federal government’s technology that will deliver dramatically better services for citizens. Government needs to catch up with the technology revolution." A 2016 US Government Accountability Office report estimated the US government spent more than US$80 billion in IT annually, excluding classified operations. In 2015, the US government made at least 7000 separate IT investments and some agencies were using systems that had components at least 50 years old. Trump in March signed an order to overhaul the federal government and appointed son-in-law, Jared Kushner, to lead a White House Office of American Innovation to leverage business ideas and potentially privatise some government functions. 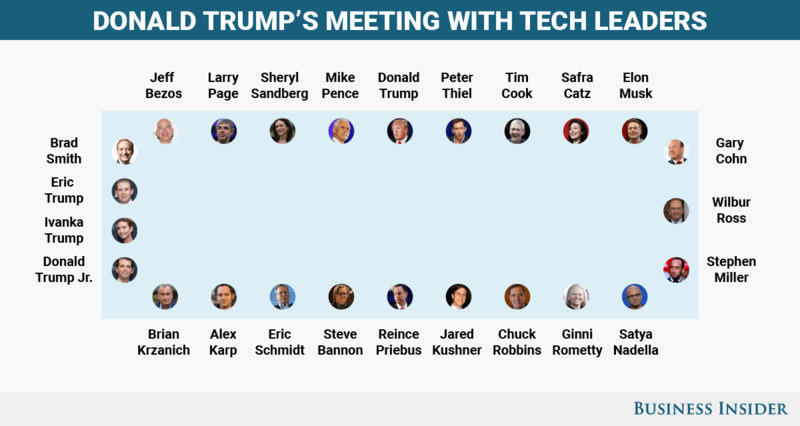 Trump also formed an American Technology Council in May to support efforts to modernise the US government. Kushner said the administration wanted to "unleash the creativity of the private sector to provide citizen services in a way that has never happened before". He said the administration was scrapping unneeded regulations for government computing systems, such as a rule on preventing Y2K issues. Most of the government's 6100 data centres can be consolidated and moved to a cloud-based storage system. "This (current) structure is unsustainable," Kushner said. “The US should have the most modern government in the world. Today, it doesn’t." Apple CEO, Tim Cook. Amazon CEO, Jeff Bezos, said he wanted the Trump administration to make use of commercially available technologies, worker retraining, machine learning and artificial intelligence. Others attending include Alphabet/Google executive chairman Eric Schmidt and CEO Larry Page, Tesla's Elon Musk, and the CEOs of Microsoft, IBM, Intel, Oracle, Cisco, and Adobe. Facebook CEO Mark Zuckerberg was invited but could not attend because of a conflict, however Facebook was represented by COO, Sheryl Sandberg.